“I first became aware of Black Bough when my son bought a vintage Breitling watch, and later I requested to be put on the fortnightly email list. I had no real interest in vintage watches but thought it might be worth having a look to see what was on offer. 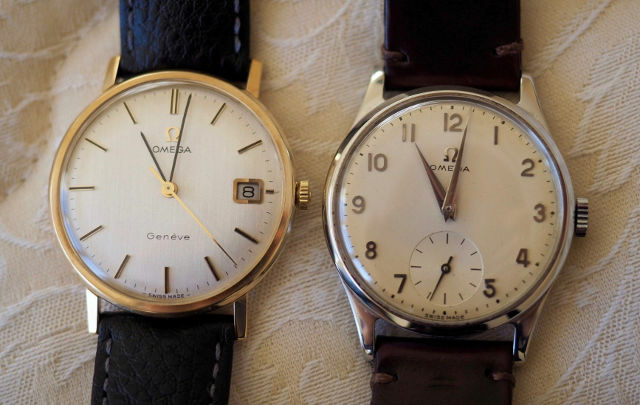 The first email that came my way produced an image of the Omega Ref.720 c.1954 (pictured above right) and immediately my interest was piqued, firstly because that was the year of my birth and secondly the simplicity of the watch appealed to me. It looked in good condition so I contacted Alex and asked if it could be put aside for me to see it for myself. Luckily my wife and I were visiting our son in Wales so we took a day out to travel up to Ludlow. Unfortunately, it was a very wet day so the town did not look its best, but we found the shop easily. Alex was away that day but Adam was very helpful and produced the watch for my inspection. I wasn’t too keen on the pigskin strap that went with it so asked if it could be swapped with a stirrup hide one and this he readily did. Trying it on it felt light and comfortable and looked very smart. However, I was still not sure. Did I really want to revert to having to wind up a watch every day after years of using a quartz one? I decided it might be rather pleasant to start the day in this way and went ahead. I’ve had the watch now for almost a year and have worn it every day (except when doing jobs about the house), taking it away on holidays here and abroad. It doesn’t scream expensive at anyone but I know I’m wearing something special. What about accuracy? Well, I was always one for punctuality, and still am, but does a minute or so every week really make a lot of difference? And anyway, it only takes a small pull of the crown and turn to adjust. To be fair, it’s kept very good time and only needs a slight adjustment now and then. No more watch batteries to buy, although I am aware that after a few years I will need to get it serviced. As to its age, well it’s about the same age as me and in lot better condition so that can’t be a bad thing. I wasn’t particularly looking for another watch after my initial purchase, although I’ve always had a look at the fortnightly updates from Black Bough. Almost a year since my first purchase I found the Omega Geneve Ref. 131.5016 1973 model (shown above left) looking at me and a little spark of interest was triggered. 1973 was a momentous year for me. It was the year my mum died and also when I started University. I contacted Alex who answered a large number of questions I had about the watch, including why it had a black strap. On explaining that he thought it complemented the black inserts to the hands and indexes I could see what he meant. Living in Devon, I didn’t want to make the journey to Ludlow this time so asked about postage and when it would arrive if I went ahead with the purchase, especially as this was a Friday. Alex said it should be with me the following day so after about ten seconds of deliberation I went ahead. On the following day, I realised that Royal Mail special delivery is not always guaranteed for a Saturday unless extra charges were made, but tracking the item online I could see that it had arrived at my local sorting office. Luckily I was able to phone and told that it would be with me by 1pm, and late in the morning it arrived. As the post lady came over the road with the parcel precariously balanced on her arm it almost slipped and fell! Luckily it did not and I proceeded to unwrap the parcel. Would the watch look and feel as good as the pictures and video on the website? I was not disappointed. The watch is very smart and as good as my other one. I particularly like how the seconds hand sweeps smoothly around the dial. Winding it is not as easy because the crown is smaller, and changing the time can be tricky because if you pull it out too far the date changes which necessitates changing the dates until you get back to the one you want, but I’m sure I’ll get more adept at that as time goes on.